Happy Glider Toys for 2016 are now available for orders! * Silk flowers can be used by placing a yogurt drop or small piece of dried fruit tucked between the petals. Your gliders will smell the treat, then forage for it. * Acrylic flowers are an exclusive feature of our Happy Glider Toys made for giving your gliders acacia gum. Toys with this feature come with a 1oz. packet of Acacia Gum powder. Simply mix a small amount of the powder with a few drops of water to make a paste, then use a toothpick to put a dollop of the gum into the throats of the acrylic flowers. Your gliders will have to find it, then use their long tongues to get to the treat. Gum from acacia trees is a natural food source in the wild. You can also use honey or yogurt in these flowers. * Plates and bowls can be used for larger treats such as fruit slices. Some people also use them as feeding stations where they place their gliders' food each evening. * Cups and goblets are great places to tuck your gliders' mealworms or other insects. * Tail carriers also love the long dangling chains, bangles and pulleys incorporated into many of the toys. Straw pompoms from Rayray at the Sugar Love Shack fascinate gliders, too. Your gliders' will be kept intrigued for hours trying to figure out how to get these features into their nest. Note that all toys are custom made for each order. Please allow 7-10 business days so I can make your toys. I do have a selection of Premade Happy Glider Toys available. This collection of toys is ready for immediate shipment. The selection will change periodically so check back often to see what's new! Another new Happy Glider Toy is now available! the 2016 Happy Animal Crackers Forager features a straw pompom made by Rayray of the Sugar Love Shack; acrylic flowers for acacia gum foraging (1oz. packet included); a 7" diameter plate for treats and/or feeding; and a silk flower for treat foraging. All of this is set off by gorgeous animal charms. Squirrels (shown), Tigers, Lions, Elephants, Owls, Parrots, Butterflies and Swans available*. Available in plate colors of blue, purple, magenta, orange, yellow and lime green. Each toy ordered will be custom made in the colors* of your choice. *Animal colors vary by animal. Please specify 2 or 3 toy colors in addition to the plate color and I will try to accomodate you. If specified colors are not available, you will be contacted via email. Base shipping rates for outside the U.S. are based upon the total weight of the order. Please note that there may be a surcharge for Global Shipping & Handling based upon the total shipping weight of your order. You will receive a separate e-mail from me once your order has been processed advising you if there is a Global S&H Surcharge (GSS), and an invoice will be sent to you via PayPal for the GSS. Your order will not be shipped until the GSS has been paid. Please also note that any postage or customs fees due upon your package's arrival are your responsibility to pay. I make out the customs slips to hopefully avoid any surcharges at the recipient's end but I am not responsible for the fees if they do occur. 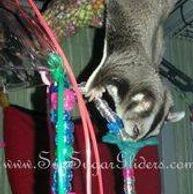 By placing an order via Suz' Sugar Gliders, you are accepting the terms as outlined above.